The Seattle Police Department had a little fun at Alex Jones’ expense recently. While the hobby is nothing new–even in Seattle–it may mark the first time a police department has taken time off from defending property and privilege to troll the popular conspiracy theorist who is largely known for claiming the Sandy Hook Massacre was a staged psy-op meant to scare people into supporting tougher gun control measures. After Jones was seen chasing people on the streets of Seattle, shouting various iterations of “f*ck” and “cuck” at them for disagreeing with his views regarding the hobgoblinization of America, and eventually getting coffee dumped on his head, one Twitter user reported Jones’ comically unwelcome presence to the cops–though it wasn’t apparent the talk show host had committed any crime. The Seattle Police Department’s official Twitter account responded with a semi-decent troll, saying that they weren’t sure if it was the real Alex Jones. The tweet is an apparent reference to Jones’ public custody battle with his ex-wife. 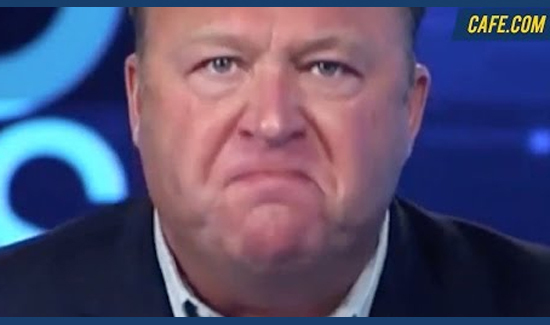 In an effort to retain full custody of his three children, Jones claimed–by way of his attorney–that his famously volatile, sometimes-violent, conspiracy-promoting media image is just an act. Jones’ attorney repeatedly told a family court judge in Austin, Texas that his client behaves completely differently when the cameras and microphones aren’t there to capture his often obscene and conspiratorial antics.